BRISTOL SHOW 2011: Spendor unleashes a pair of new stereo speakers | What Hi-Fi? The company describes the A3 as "an ultra-compact, high-performance floorstanding speaker" incorporating drive unit technology and cabinet engineering from its SA1 and A5 models. The 15cm mid/bass driver is designed and manufactured by Spendor. With a cast magnesium alloy chassis, ep38 polymer cone, phase correction technology, and a long-throw minimal thermal compression motor system, it ensures "a clear and natural midrange sound with excellent low frequency power handling", the company claims. A phase linear crossover network is used to integrate the mid/bass unit with a 22mm wide-surround tweeter. The crossover is mounted on a "non-resonant panel" which incorporates insulated gold-plated terminals. Veneer finishes available for the cabinet are light oak, dark walnut, cherry and black ash. The plinth is in contrasting black satin lacquer. Joining the A3 is a revised version of the legendary S3/5R model, based on the BBC-designed LS3/5A mini monitor. The Spendor S3/5R2 is a two-way infinite baffle standmount design with a new 14cm Spendor mid/bass drive unit fitted with an ep39 polymer cone, and a 22mm wide-surround tweeter. It combines a Spendor thin-walled damped cabinet panel structure with controlled bracing. The cabinet has no rear port, so can be placed close to a wall. 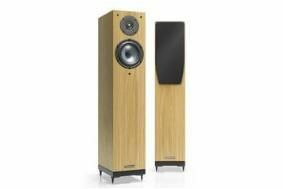 Spendor says the S3/5R2 is an ideal surround/rear speaker for multichannel systems. It's available in in light oak, dark walnut, cherry and black ash natural veneer finishes.